MANILA – The Philippines chapter of the International League of Peoples’ Struggle (ILPS-Phils) commemorates today the world-inspiring “people-power” uprising which toppled the US-puppet fascist regime of Marcos in 1986. Yet, with not a few misgivings. “It was not a revolution. It turned into a counter-revolution — against the people. Thus, the social conflicts have become even much more pronounced,” ILPS-Phils Chair Elmer Labog said. 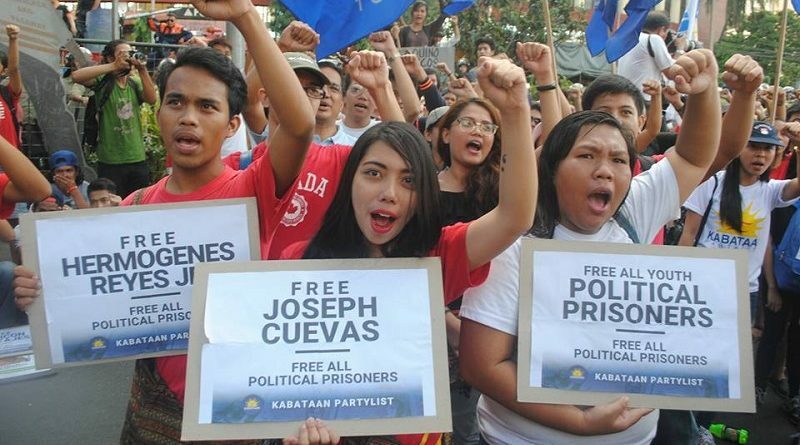 “It has been 30 years since the supposed return of Philippine democracy, but power remains with the ruling elite latched on by the international cabal of creditors and investors. Foreign banks and corporations feast on our resources while the majority of the Filipino people are disempowered by worsening poverty and injustice. The U.S. pretty much calls the shots — from the automated electoral system (AES) of Smartmatic, to trade agreements and economic policies, to diplomatic relations and military pacts,” Labog added. Thirty years would have been enough for a country to industrialize. The nascent local capital in post-war reconstruction was siphoned off by the crony capitalism of Marcos, state assets privatized by successive regimes, and the country today on sale before the US-led integration in APEC, ASEAN and Trans-Pacific Partnership. While local finances are bled dry by the usurious loans of the World Bank-IMF, sheer profit-seeking led to joining China’s Asian Infrastructure Investment Bank whatever saber-rattling there is in the South China Sea. While money knows no borders, Pres. Benigno Aquino III became the biggest debtor in the entire history of the country leaving us with P6.4 trillion of outstanding national government debt, of which P4.16 trillion of borrowings were made during his term. An average of 27.21 percent of annual public revenues are automatically earmarked for interest payments since 1986. The massive conversion of agricultural lands led to more landlessness for nine out of ten farmers. Despite the government’s extended Comprehensive Agrarian Reform Program, vast plantations and haciendas remain with landlords, corporations, speculators and their holding companies. The Hacienda Luisita massacre, as in other cases of human rights violations, remains unresolved. There are more unemployed and underemployed Filipinos than at any time in the country’s history, estimated at some 12.3 million last year according to IBON research. Around 66 million Filipinos are poor trying to live off Php125 or much less per day for all their food, shelter and other needs. Water and electric utilities, infrastructure and basic services like education, health, housing, transportation and communications were skewed for private profit. U.S. military bases were booted out of the country in 1991 but the U.S. bounced back with the Visiting Forces Agreement (VFA) and Enhanced Defense Cooperation Agreement (EDCA) with practically lease-free access to Philippine camps, sea ports and airfields. Modernization of the Armed Forces of the Philippines for “credible defense” only meant more war materiel for U.S. intervention and aggression in this part of the world. The world continues to be inspired by the Filipino people not by its shameless post-EDSA governments. Oppressed nations and peoples find resonance with our own struggles for national and social emancipation.